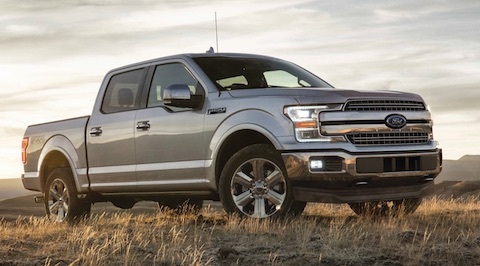 Both the Ford F-150 and Toyota Tacoma are best-selling pickups in their respective classes. The F-150 is the best selling full-size truck in the U.S. while the Tacoma is the best selling mid-size truck in the U.S. These trucks have each earned excellent reputations for capability and reliability and both offer a variety of off-road features. We know that you have many options when shopping for a new truck so we put together the following comparison to help with your research. The Toyota Tacoma is smaller and less work-oriented than the F-150 and the base MSRP reflects this: Tacoma is priced around $25,500 and F-150 pricing starts around $28,000. Beyond the sticker price, fuel economy is the biggest cost-to-own factor. The F-150 and Tacoma offer similar MPG ratings with the F-150 offering a better combined MPG. The best fuel rating for the 2019 Toyota Tacoma is 20 mpg city/23 mpg hwy/21 mpg combined – for the 2.7-liter 4-cylinder rear-wheel drive model. The top fuel rating for the F-150 is 19 mpg city/25 mpg hwy/22 mpg combined – for the 3.3-liter V6 rear-wheel drive model. Unlike the Tacoma, the F-150 is now available with a new diesel engine that changes the playing field for fuel efficiency. The new F-150 3.0-liter Turbodiesel engine offers a remarkable 22 mpg city/30 mpg hwy/25 mpg combined – for the rear-wheel drive powertrain. The 2019 Ford F-150 is, hands down, the more powerful of these two trucks. The Tacoma offers two engine options, neither of which is up to par with even the F-150’s weakest engine. 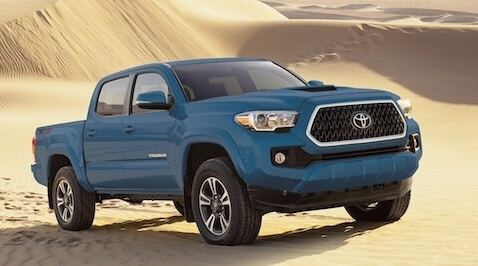 The most powerful of these is Tacoma’s 3.5-liter V6, which produces a respectable 278 horsepower and 275 lb-ft of torque. Of the six engine options the Ford F-150 delivers up to 450 horsepower with 510 lb-ft of torque. As for hauling capacity the Tacoma is rated to tow up to 6,800 pounds, nowhere near the F-150 tow capacity of up to 13,200 pounds. Considering the F-150 and Tacoma are in different size classes we’ll use the most similar body design, the 4-door crew cab configuration, for this comparison. The F-150 SuperCrew offers 40.8 inches of headroom and 43.9 inches of legroom up front. Second row F-150 passengers get 40.4 inches of headroom and a whopping 43.6 inches of legroom. The Tacoma’s 4-door Double Cab configuration offers 39.7 inches of headroom and 42.9 inches of legroom up front. In the second row, things are pretty tight, with only 38.3 inches of headroom and 32.6 inches of legroom offered. Both the F-150 and the Tacoma perform well in crash testing conducted by the Insurance Institute for Highway Safety, earning Good scores across all major categories. Both vehicles also offer ample driver-assistance safety features, scoring them extra points. As for connectivity and entertainment, the F-150’s infotainment setup is years ahead of the Tacoma’s. The F-150 is available with an 8-in infotainment screen running the latest version of Ford’s Sync infotainment system. Additionally, both Android Auto and Apple CarPlay are included, as is 4G LTE capability that can be used to create a mobile hotspot in the vehicle. The Tacoma’s infotainment setup lacks compatibility with Android Auto or Apple CarPlay and offers only Toyota’s Entune setup.